Reprinting the original tales of the Darknight Detective from the late 1930s, Batman Archives Vol. 1 is a remarkable look back at the early adventures that built the foundation for the legend of the Caped Crusader and the Boy Wonder. 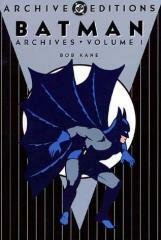 Showcasing artwork by Bob Kane, the creator of Batman, this amazing hardcover edition features the first appearances of Batman, Robin, Professor Hugo Strange, and the freakish Clayface. Also included in this beautiful archive edition is one of Batman's first confrontations with the madman who would become his greatest rival, the demented and deadly Joker.